Are you a fellow who was addicted to watch new Movies or Tv series and if you are looking to download or stream movies or Tv shows on your iPad for free? Then you should follow our instructions now. I think currently all cydia lovers knew about the new HD movie and Tv shows streaming application of Moviebox. The app was in Cydia, available for iPhone and iPads running on iOS 8 or higer. The latest moviebox application version is iOS 8.4, can use all iPhone and iPad running on iOS 8.2 – iOS 8.4.1. HD movies, Tv shows and music videos can stream on Moviebox comfortably. It allows to download full HD movies for free and save to watch after offline. iOS 8.4.1 is the latest mobile operating system which was released in nearly day. So yet any jailbreak community could not enter in the iOS 8.4.1 security system. 100% sure nowadays all jailbreakers are trying to jailbreak iOS 8.4.1 to download cydia. However unbroken stage does not barrier to the Moviebox installation on iOS 8.4.1 iPad, because there are two ways to install moviebox on your iPad like iFunbox/iTools or vshare downloading. But now we are not going to guide about install moviebox. If you are not already install moviebox you can follow our link given below. 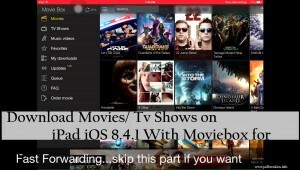 If you need to download movies or Tv shows on your iPad for free, Moviebox installation is the best way. The application opens the entry to download or stream movies or tv shows for free up to 720p. If you are streaming videos at 720p, sometimes you may encounter unexpected freezes while watching them, so I prefer streaming videos at 480p. Especially Moviebox is supporting with Airplay as well. At a time, Moviebox lets to download more than one movie, but the second one does not begin to download before the previous one is finished. If you are facing issues when you streaming or using AirPlay, close all other apps and stop the movie for few times and begin to spring again. Then it should work as well. Moviebox takes couple of hours for the complete movies download. Moviebox lets to move to the other application while the downloading movie, but sometimes downloading will pause. So when you come back to download, if you see the movie download pause, you have to do press “Play” again to continue the download. Moviebox lets to download movies which are still out in movie theater or some are their purchased before release date. Ex : Dark Night Rises, Django and Top Gear (Tv Show). If you have downloaded movie which feel like the audio was too low, go to the movie’s info and adjust the volume using iTunes. Moviebox is updating its database with new tv shows and new movies everyday. We invite you to install moviebox on your iPad and download your favorite movie for free on iPod touch via Moviebox. Most Apple users are already knew about MovieBox. But if you are a new comer to the iWorld, then our instruction will help you to know about MovieBox. MovieBox is the free popular movie streaming application that let to watch HD movies, Tv shows and music videos comfortably. The latest movie streaming app is compatible for all iPhone, iPad or iPod touch running on iOS 8.1.3 to iOS 8.4.1 firmware. As you know that Apple has already released iOS 8.4.1 officially to download. But it does not jailbroken yet. Rumours are indicating taiG v2.4.4 jailbreak for iOS 8.4.1. If you think that jailbreak is the main requirement for MovieBox installation. But it is not true. There are two ways to install moviebox iOS 8.4.1 on your iDevice without jailbreak. Users can use iTools or iFunBox to download MovieBox or users can use vshare to download moviebox. As I mentioned, moviebox is the great awesome app introduced with much more features as free online HD movies, download full HD movies for free, no crashes, faster streaming and especially new episodes, movies or Tv series are updating daily. I think you should really try to take moviebox experience. However now we are going to guide to install moviebox on iOS 8.4.1 using vShare downloading. Step 1 – You should open the Safari browser. Step 2 – Go to the vShare.com page using your idevice. Step 3 – Click on the “Download (Unjailbroken) key. Step 4 – You can see the popup message asking your permission to install vShare. Click the “Install” key. Step 5 – If you saw installation complete, then open it and press “Trust”. Step 6 – Type “MovieBox” on the vShare search bar and click enter key. Then you can see the “MovieBox” bar as the first result of search. Step 7 – You can see the “Install” button at the right side of the result. You should click on that button to start download. When it is finished Moviebox will be install itself. If it does not install itself, you have to go to the vShare downloaded file and then install again. Step 8 – You can see the Moviebox icon on your device home screen at the end of the whole proceed. See you then later with new information about MovieBox. We invite you to enjoy with moviebox.